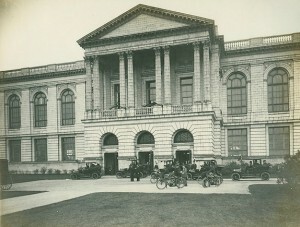 Before the introduction of the International Trade Commission by the U.S. Department of Commerce in the 1920s, the Philadelphia Commercial Museum was considered by many as a beacon of commercial knowledge. 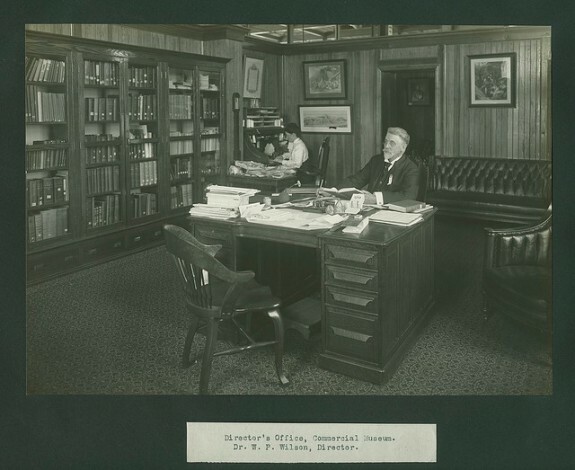 It housed a research library and it operated a Bureau of Information that published international trade and market reports to aid American entrepreneurs and to expand their endeavors abroad. Inspired by the 1893 Columbian Exposition, the Philadelphia Commercial Museum was built in a Neoclassical style meant to convey the museum’s legitimacy through its architecture of empire, its rational style, and the high-mindedness of its content. This content catered not only to schoolchildren but also to professionals in international trade. 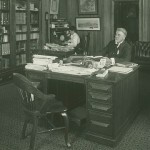 William P. Wilson, seated at his desk in this photograph, served as the first director of the Philadelphia Commercial Museum. A former professor at the University of Pennsylvania, he was inspired to establish the museum after he visited the 1893 Columbian Exhibition in Chicago. 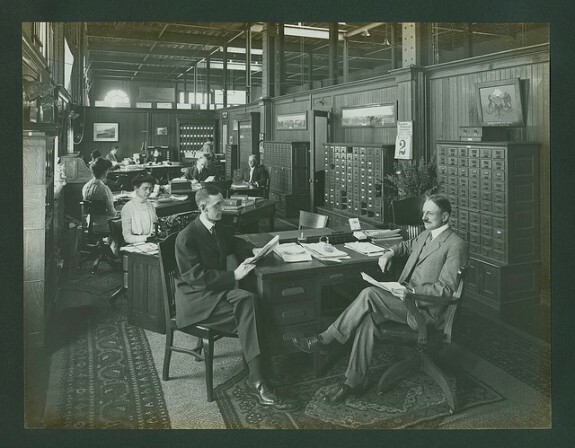 The goal of the museum was to educate the public about the importance of commerce while also providing a research library to foster commercial connections. 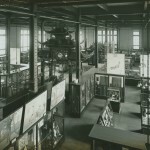 Holding to the principle that commerce was the unifying principle of mankind, the Philadelphia Commercial Museum displayed trade items from around the world. 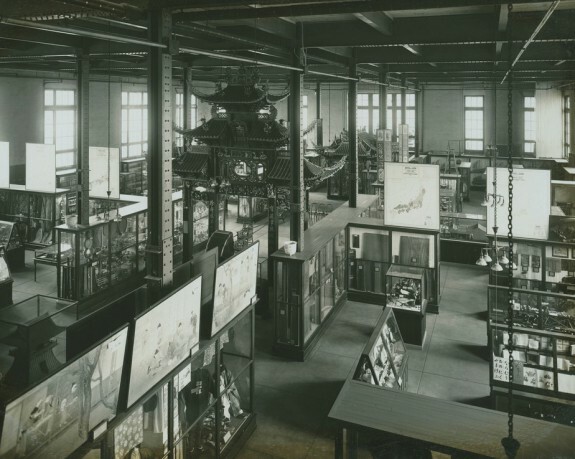 This photograph of the museum’s collection of Chinese and Japanese trade goods shows works of art, Japanese and Chinese cloth, and a Chinese gate on display for visitors. The Philadelphia Commercial Museum sought to educate the public about the merits of commerce. In order to reach as many people as possible, the Commercial Museum coordinated with school districts from across the region to arrange for students to tour the museum’s collections. In this photograph, students from a public school tour the Philippines section of the museum and looking at cloth manufactured in the Philippines. 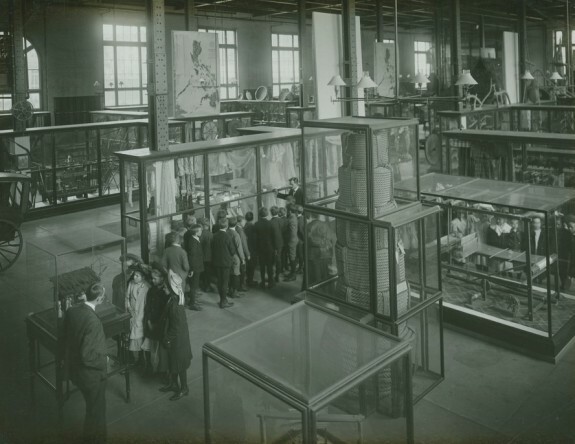 Opened to the public in 1897, the Commercial Museum was the foremost source of international trade knowledge for American manufacturers at the turn of the twentieth century. 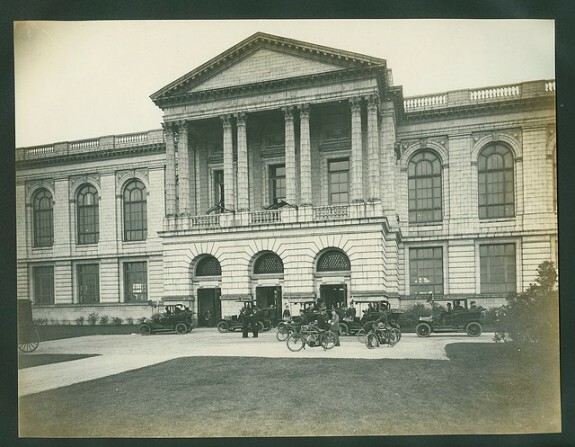 Located on the western bank of the Schuylkill River in Philadelphia, the museum served as a reference library for merchants, facilitated connections between American export traders and foreign markets, and housed exhibits featuring hundreds of thousands of raw materials and goods from around the world. The rise and fall of the Commercial Museum paralleled Philadelphia’s transition over the twentieth century from a hub of industry and trade to a city with a post-industrial economy. Central to the mission of the Commercial Museum was the notion that commerce was the unifying principle of mankind: past, present, and future. The 1890s marked a period of global transformation, during which the industrial economy of the United States continued to expand. In response to the manufacturing boom, American manufacturers began to seek foreign markets to sell their products. They also exhibited their wares at the world’s fairs that characterized the latter half of the nineteenth century. One of those fairs, the 1893 World’s Columbian Exposition in Chicago, had a role in the creation of Philadelphia’s Commercial Museum. Among the many American traders and manufacturers enticed and inspired by the Chicago fair was a former botanist and University of Pennsylvania professor, William P. Wilson (1844-1927). After visiting the Columbian Exposition, Wilson officially founded the Commercial Museum the same year, housing the collections in a variety of temporary locations until the building was officially completed in 1897. Borrowing the neoclassical style of the Columbian Exposition, the Commercial Museum communicated legitimacy through the architectural style of empire, rationality, and intelligence. The Commercial Museum acquired many items from the Columbian Exposition and eventually became the official repository for artifacts from many of the world’s fairs of the era. The Commercial Museum aimed to educate everyone about the merits of international trade. Schoolchildren from across the region came to learn about the pivotal role of commerce throughout history and to explore strange artifacts from faraway lands. Merchants came from around the globe to educate themselves about foreign markets and production methods by examining raw and manufactured goods held in the collections. 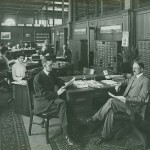 The Commercial Museum also administered a Bureau of Information, which compiled and published international trade and market reports to aid American entrepreneurs as they expanded their enterprises at home and abroad. Inspired by the idea of a commercial museum, American and foreign business leaders in California, France, Berlin, China, and more developed similar museums and hosted world’s fair-style expositions in order to develop transnational trade relations. The museum reigned as the foremost authority on information regarding manufacturing and international commerce in the United States for a quarter century. 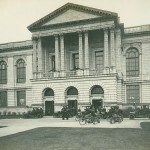 The Commercial Museum’s prominence as a beacon of commercial knowledge and exhibits began to wane by the 1920s. A variety of social, political, and economic factors rendered it increasingly irrelevant, the most significant of which was the rise of the International Trade Commission. 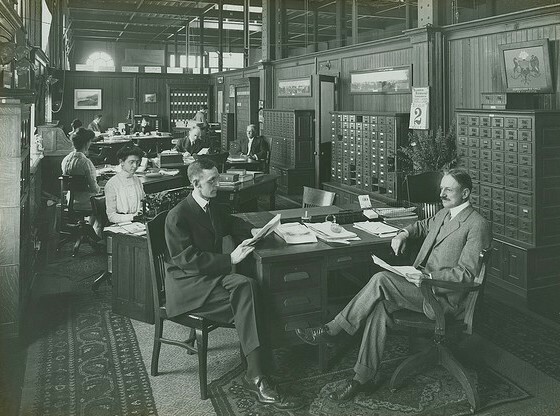 Developed by the United States Department of Commerce in 1916, the International Trade Commission was closely modeled after the Commercial Museum’s Bureau of Information. Until then the museum acted as the unchallenged provider of international trade intelligence, market reports, and commercial knowledge. The Trade Commission, among other newly formed transnational trade institutions, began to assume this role by publishing international trade and market reports. By the 1950s the museum had become obsolete. After decades of decreased public interest and visitation, in 1952 the City of Philadelphia restored and attempted to revitalize the Commercial Museum and neighboring Convention Hall. The museum was rebranded as a part of the Philadelphia Civic Center, but its staff was drastically reduced. Thereafter known as the Civic Center Museum, it continued to provide educational programming and display exhibits until 1994, when it closed indefinitely. In 2001 the City of Philadelphia, through the Orphans’ Court, dispersed the majority of the Commercial Museum’s holdings to universities, museums, and archives around the city. 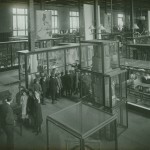 Among these, Temple University’s Anthropology Lab, the University of Pennsylvania Museum of Archaeology and Anthropology, the Independence Seaport Museum, and the Philadelphia History Museum gained significant collections. The Civic Center and museum building complex were razed in 2005 and became the site for the University of Pennsylvania’s Ruth and Raymond Perelman Center for Advanced Medicine. The Pennsylvania Convention Center, located at Eleventh and Arch Streets, became Philadelphia’s center for commerce and trade, acting as a venue for international trade shows and other events. Grace Schultz earned an M.A. in History with a concentration in public history from Temple University and is an Archives Technician at the National Archives at Philadelphia. Conn, Steven. Do Museums Still Need Objects? The Arts and Intellectual Life in Modern America. Philadelphia: University of Pennsylvania Press, 2010. Conn, Steven. Museums and American Intellectual Life. Chicago: University of Chicago Press, 1998. Wolfrom, Katelyn A. “The Rise and Fall of the Philadelphia Commercial Museum: How a Forgotten Museum Forever Altered American Industry.” Independence Seaport Museum. Spring 2010. Walsh, Casey. “Anthropology and the Commodity Form: The Philadelphia Commercial Museum.” Critique of Anthropology 32(3) 2012: 223–40. Civic Center Records, Philadelphia City Archives, 3101 Market Street, Philadelphia. Philadelphia Commercial Museum Photograph Collection, Pennsylvania State Archives, 350 North Street, Harrisburg, Pa.
Temple University Anthropology Lab, Commercial Museum Artifacts, 1114 W. Berks Street, Philadelphia. University of Pennsylvania Museum of Archaeology and Anthropology, African Section, North Africa Collection, 3260 South Street, Philadelphia. African American Museum in Philadelphia, Civic Center Museum Collection, 701 Arch Street, Philadelphia. Independence Seaport Museum, Commercial Museum Collection, 211 S. Christopher Columbus Boulevard, Philadelphia. Informative and interesting story of another lost Philadelphia treasure. Really well done, Grace, both in content and style. I liked the way you brought in the significance of the International Trade Commission of the US Dept. of Commerce in its demise. That underscores the national role this institution had played. Though its role for American business was over, for a few generations every school child in Philadelphia participated in the educational programs of the Commercial Museum. In most cases, it was that child’s only exposure to other cultures and PA’s rich industrial history. For 9 years I was Curator of Education at the Civic Center Museum, and currently am President of the Oliver Evans Chapter of the Society for Industrial Archeology. Thank you for doing this.